If you want a snapshot of Japan’s incredible custom culture, you’ll find it at the annual Yokohama Hot Rod Custom Show. This year’s Mooneyes show (as it’s known) happened less than a week ago, attracting fans from the world over. A win at Mooneyes is one of the most prestigious accolades on the circuit. But we weren’t surprised when we heard that Kengo Kimura took home top honors this year. Kimura-san—the hands and mind behind Heiwa MC—is one of the top craftsmen in the world today. 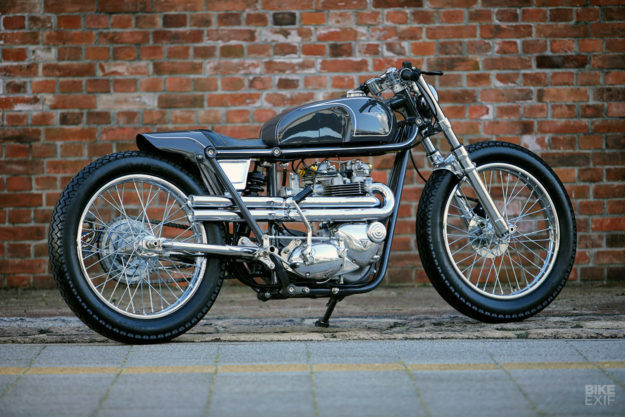 This 1971 Triumph TR6 is the bike that put him on the top step at Mooneyes. From a distance it’s suave and well proportioned—but the closer you get, the more clever engineering you’ll uncover. Kimura-san sourced the donor in the US, but there’s little left of the original. When he got it, it was a beat-up chopper with a diamond tank, in dire need of a makeover. He envisioned something straight, sleek and narrow, and set about building it—from scratch. You’re looking at an all-new frame, and if you’re wondering what those dots are along its length; they’re fasteners. 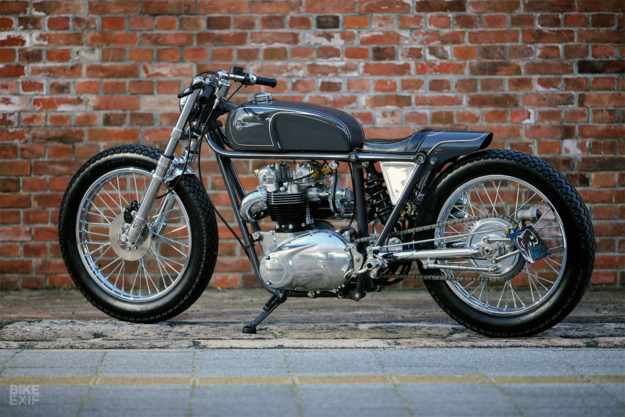 The frame’s a three-piece affair, with a bolt-on subframe that runs all the way from the steering head to the tail. There’s more magic out back, with a custom-built aluminum swingarm and mono-shock arrangement. Rounding out the suspension package is a set of Paioli 38mm forks from a Scorpa Easy trials bike, held in place by new triples. The Triumph rolls on freshly laced 19” steel hoops, wrapped in Avon Mk 2 tires. And the front brake’s been upgraded with a Brembo caliper and a solid disc. But it’s up top where things get really interesting. 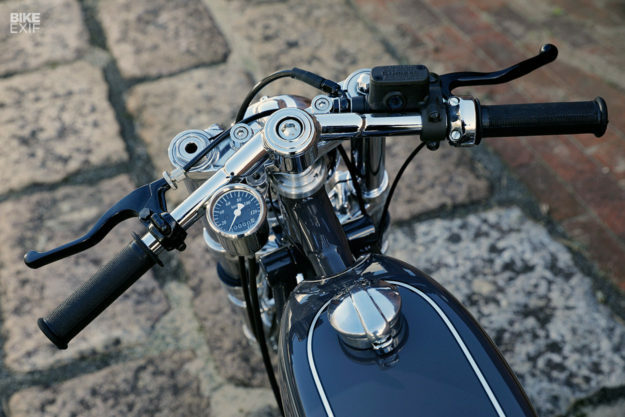 Kengo wanted the handlebars mounted at a specific height and angle—but a traditional setup wouldn’t work. 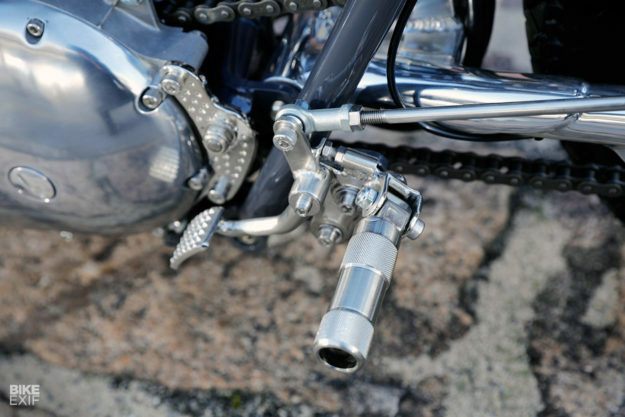 So he dreamt up a one-piece handlebar that clamps to a brace mounted to the top triple. 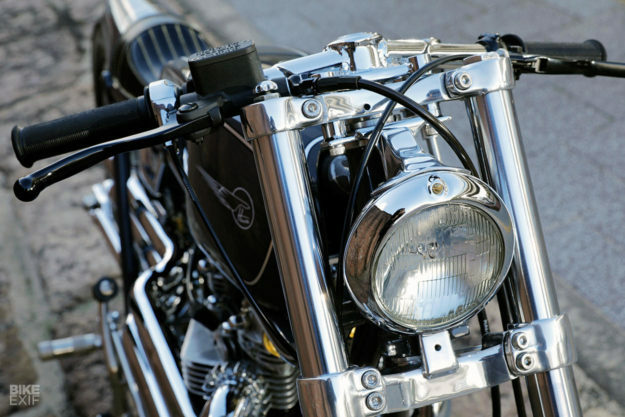 Lower down, the bottom half of the system attaches to a bracket that holds a vintage headlight. As you’ve probably figured out by now, all the TR6’s bodywork is new too. 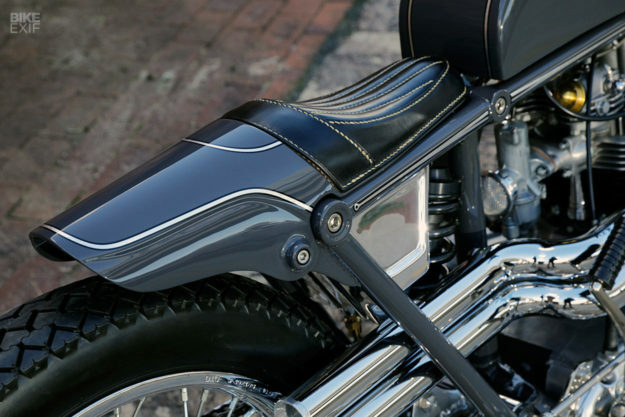 Kengo shaped a new aluminum fuel tank, tail section and oil tank by hand, then handed the seat over to upholsterer Flavor for a tasty new leather cover. Six Shooter handled the paint: a warm grey accented with silver leaf pin striping. The color—and striping—are matched on the frame. 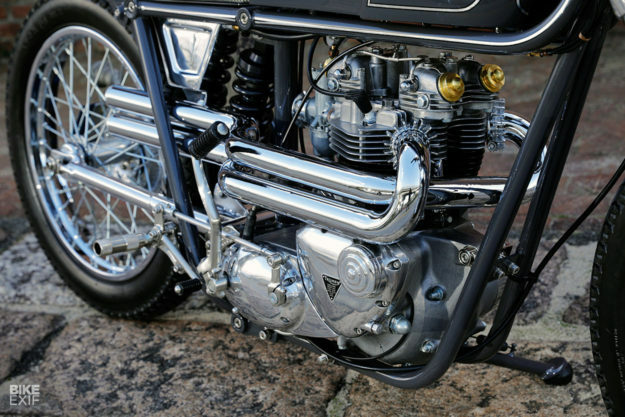 Kengo showed the engine of the old Triumph a ton of love too. It was fully rebuilt with Harris pistons, and treated to an Amal carbs with a velocity stack. The engine’s also been cleaned and polished, and probably looks better now than when it rolled out the factory. The exhaust system is a one-off, and flows elegantly back along (and into) the frame. Though it looks like a straight-through system, there are baffles hidden inside. Kengo’s handiwork can be found everywhere, right down to little things like the neat bracket holding a Heiwa MC taillight. He also fitted rear-sets with custom-made pegs, and fabricated dimpled case protector plates. Everything’s been put together with the utmost care and consideration. 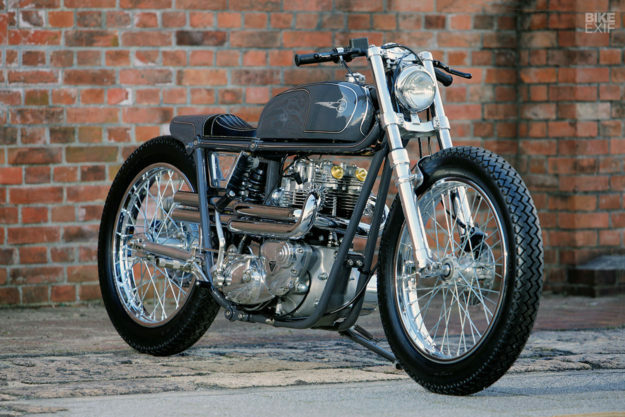 Kengo’s dubbed it the ‘Dirty Pigeon,’ but it’s anything but; for a bike that’s almost 50 years old, it’s remarkably clean. 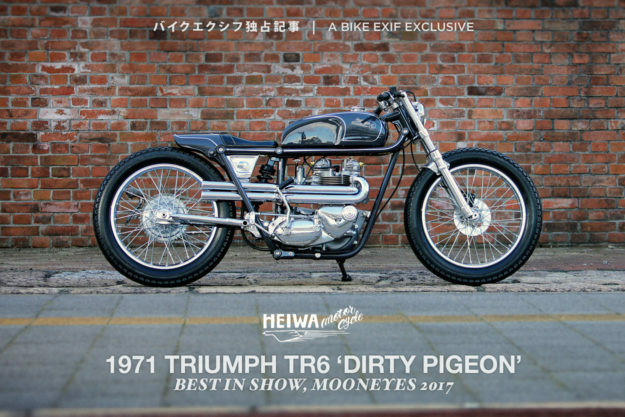 Not only did the Dirty Pigeon take home the ‘Best Motorcycle’ award, but Thompson Cycles awarded them their ‘Pick of Show’ too. 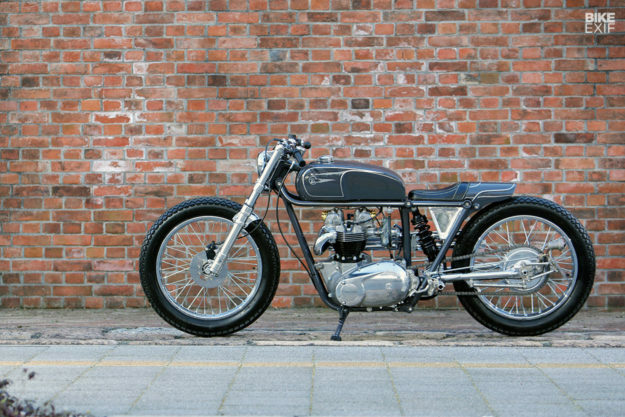 It’s an essay in old school craftsmanship and style, and a testament to Japan’s prowess in the custom scene. We’ve just nudged the Mooneyes show to the top of our to-do list. Art Deco Masterpiece: A Majestic resurfaces in L.A.